A story from the scriptures. As children color each page, they can read the story from the scriptures or listen to the scriptures on scriptures.lds.org or in the Gospel Library mobile app. This book features stories from the Pearl of Great Price, including a page for each Article of Faith. Buy a printed copy for 95 cents at store.lds.org, Distribution Services centers, LDS Bookstore, Deseret Book, and other LDS booksellers. 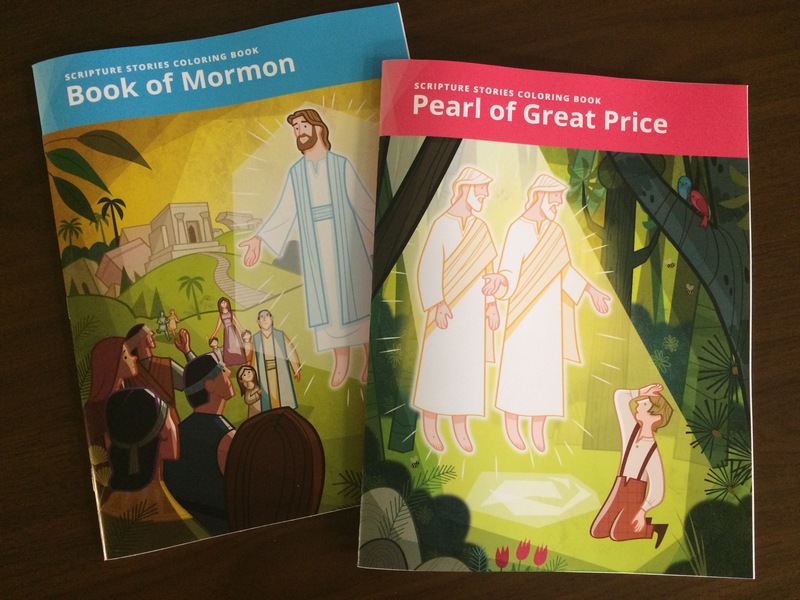 The Scriptures Stories Coloring Book: Book of Mormon that was released last year has been updated to 32-pages. It now contains more of the stories found in the Book of Mormon, including Abish gathering the Lamanites to see the conversion of their king and queen, Moroni’s fortifications, Jesus instituting the sacrament among the Nephites, and the Jaredites in their barges as they journey to the promised land. Buy a printed copy for 85 cents at store.lds.org, Distribution Services centers, LDS Bookstore, Deseret Book, and other LDS booksellers. Scriptures Stories Coloring Books for the Doctrine and Covenants, Old Testament, and New Testament are planned to be released later this year. Who illustrated it? It looks like it was done by Josh Talbott, but it doesn’t say who did. I see that the New Testament Coloring Book is available now as a hard copy for purchase. Are you going to make the PDF file available like you did for the Book of Mormon and Pearl of Great Price coloring books? The PDF isn’t available yet. When it is, we’ll post a link to it in an article on LDS365.com.